This last Wednesday we had the first meeting of our Healing Hearts ministry for those recovering from or experiencing divorce, and we used this reading to open our meeting. As we were discussing it I noticed something peculiar. When we read the gospels, usually we see Jesus as the center of all the action, healing, teaching or making this or that miracle; But in this reading the Lord takes a secondary role. Today the center of attention is someone else: a nameless woman. She is only described as a great sinner; as if this is the only important thing we need to know about her. We are never told her name or her sin, as if this information didn’t really matter. The only thing that matters is what the people of this town saw when they looked at her. However, Jesus sees something completely different; the fact that she was able to show great love, because much had been forgiven to her. And here lies the great difference between the Lord and the rest of us: We usually focus on the external, the actions, the sins others commit. The Lord Jesus on the other hand only focus on the internal, on what is really hidden in our hearts, our motives, our guilt, our sorrows. For us, it is easy to dwell on the externals, because they don’t demand that much from us. But to be able to look at someone as Jesus did requires great effort. It requires that we place ourselves in their place; and sometimes it even requires for us to open our own hearts to them. One of the main complaints I hear about religious people is that we are judgemental. And I have to admit that sometimes we tend to be like Simon, the Pharisee in this story, who not only judged this poor woman, but judged Jesus himself, for allowing her to touch His divine body. Simon focused on the actions and not on the person. 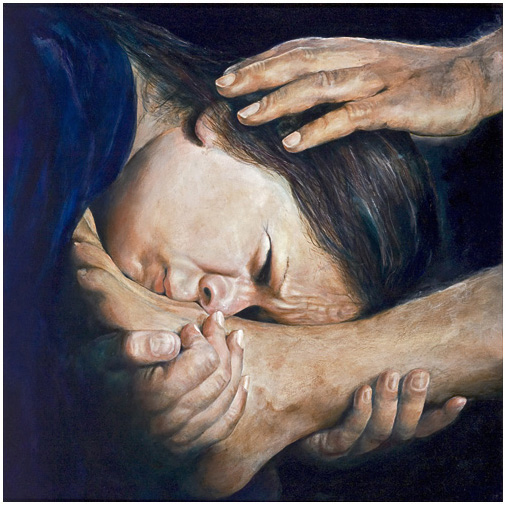 Whatever motivated Jesus or this woman to act the way they did got lost in the scandal of seeing how they reacted to each other, she washing and anointing the feet of the Lord and Jesus letting himself be touched in such a familiar and intimate way. I will venture to say that it is not just Christians who are judgemental, but we humans, every man, woman and child, have this default mode in which we operate, an attitude which makes us judge everything by our own internal standards. Luckily, in today’s gospel Jesus gives us the key for confronting this judgemental nature: by confronting the reality of our own sins. This nameless woman knew very well she was a sinner. She approached the Lord weeping because of these sins, and Jesus' acceptance made her capable of a great act of love. Simon on the other hand, approached Jesus as an equal, trying to gain his favor by honoring him, by inviting him to have dinner. Jesus could see very clearly that Simon did not think of himself as someone who needed forgiveness for much. This is why he says “those who little is forgiven, show little love”. Like I have mentioned many times, because of my ministries here at St Michael, I get to talk with a lot of people. You would not believe how many times I have someone tell me “Deacon, I don’t go to confession because I do not know what to confess!” to which I always answer “That is precisely what you need to confess!” If we can not recognize the reality of our own sins, how can we know the struggles others have with theirs? As Christians we are called to love others, but we can not accomplish this by thinking that somehow we are not like them. To be a Christian demands we take a very critical look at our own sinful nature, and seek the forgiveness we so badly need. Anything else is just falling into Simon the Pharisee's mistake. We cannot accomplish great acts of love if we ourselves are not forgiven for our lack of love for others. Although the forgiveness God gives to us is free, we need to seek it and accept it. Once we have taken this first step, it is just a matter of looking at others in the same way the Lord saw this sinful woman, in the same way he sees each one of us. God bless you my brothers and sisters.